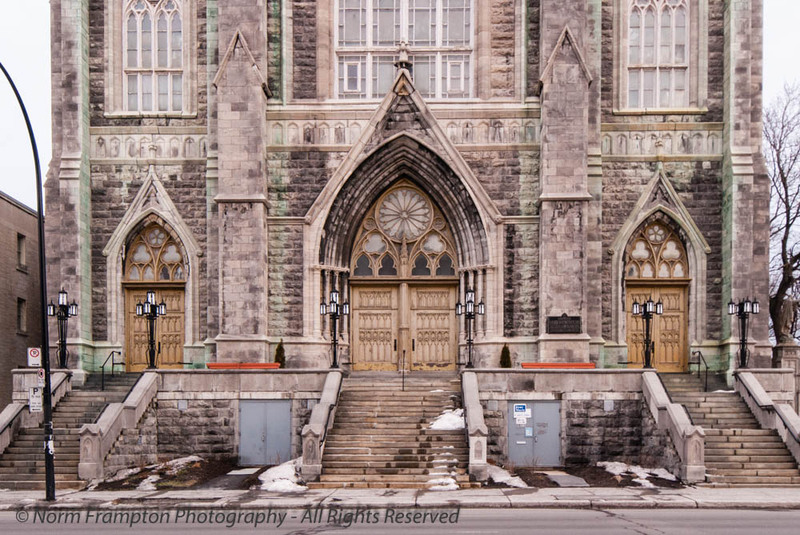 This is another of the many churches in Montréal that I’ve probably driven past hundreds of times in my life and never really noticed until I started paying closer attention to doors. 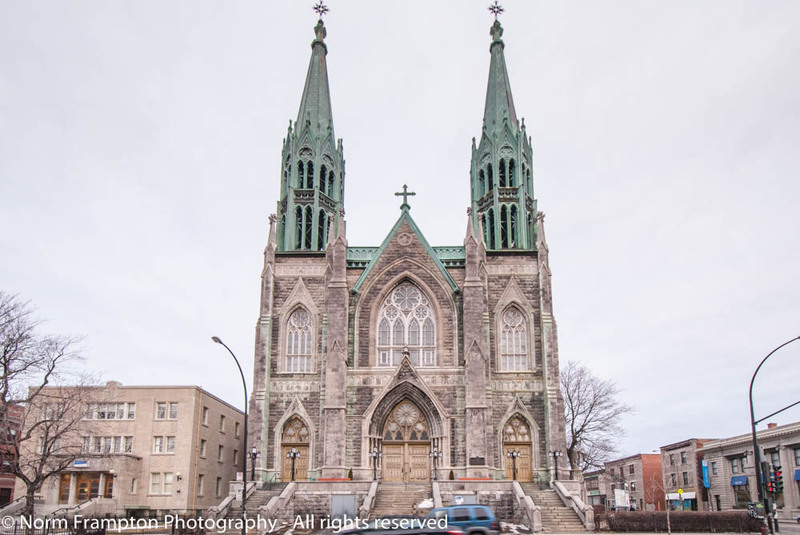 Located at the intersection Rue St-Denis and Beaubien East in the borough of Rosemont / Petite-Patrie, Eglise Saint-Edouard was built in the Gothic Revival style between 1901 and 1909. The front facade is done entirely of locally quarried limestone. The roof as well as the two bell towers are clad in copper and topped off by copper spires 210 feet (64 meters) above street level. Though I wasn’t able to find its actual capacity, this is certainly one of the largest churches in the north/central part of the city. At its peak the parish it serviced consisted of over 1,200 families. 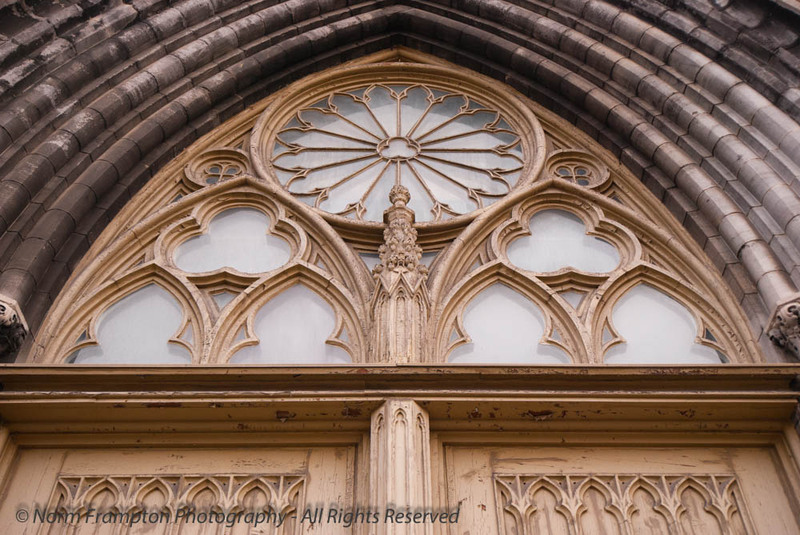 The arched stained glass above the doors and the doorways themselves contribute to the effect of vertical thrust that directs the eye skyward. The effect is of course at its most pronounced when looking up from the foot of the stairs. 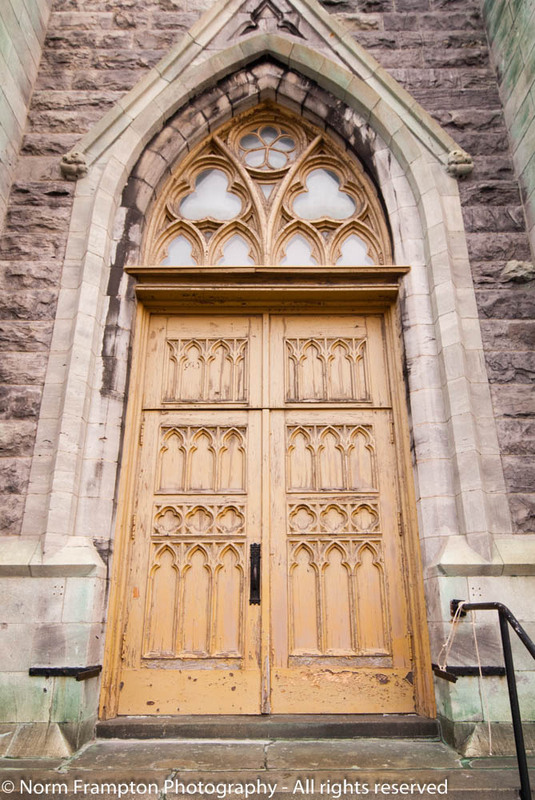 The main door and the two side doors are painted wood with decorative glass and carvings in the arch above. The carvings and glass seem to be in pretty good shape. But the doors themselves are definitely in need of some TLC. Our mix of intense cold and wet weather can be very hard on wooden doors, so hopefully they’ll get a good scraping, sanding and a fresh coat of paint this summer. 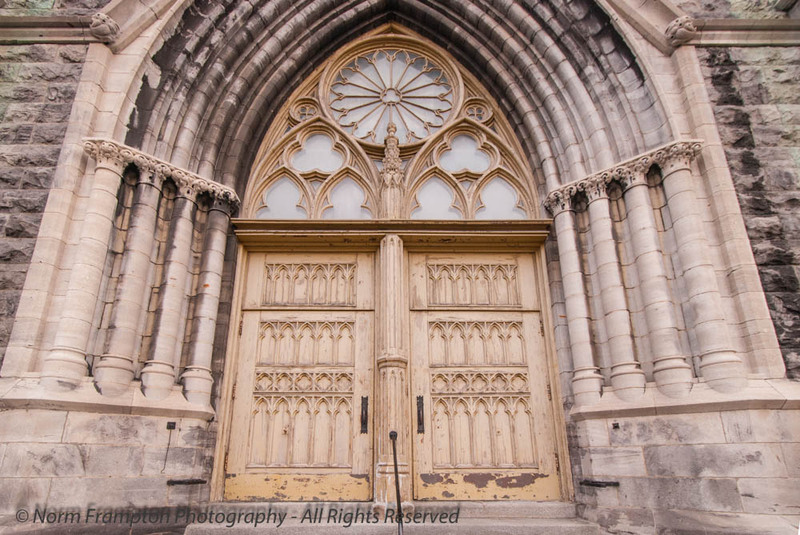 Gallery | This entry was posted in Photography, Thursday Doors and tagged Architecture, Église Saint-Edouard, Church, Doors, Historic Buildings, Montreal, Québec, rue St-Denis, Thursday Doors. Bookmark the permalink. A very impressive church Norm and great doors. The local limestone works well and I think the copper spires are terrific. Beautiful building and stunning doors Norm – I love the large central door with its 2 ‘Mini-Me’s on either side, must be most impressive to look up from those steps! Thanks Jane. I just hope those doors get the maintenance they need as soon as the weather permits it. Sounds like your weather conditions give a new slant to the idea of weather-beaten, I hope they give them some lovely nourishing linseed oil to drink when the spring arrives! This church was impressive, Norm. I admire the architecture and the details. There are so many intricate patterns and layers where it shows depth and craftsmanship. 🙂 Have a wonderful weekend. Hopefully, I am caught up in blogging! I worked 90 hours in 2 weeks and winter concert plus grandchildren visiting for Valentine’s day just wore me out! I really like the drama of the photo looking up the steps with the melting snow! The church looks like a really imposing piece of architecture compared to the surrounding buildings. Great shots! Thanks Terry. I’m a big fan of those skewed perspective, looking up shots I can get out of my ultra-wide angle lens. The challenge for me is to not go overboard and end up using it too often. Gorgeous doors! Many churches seem to have stunning doors and entries. 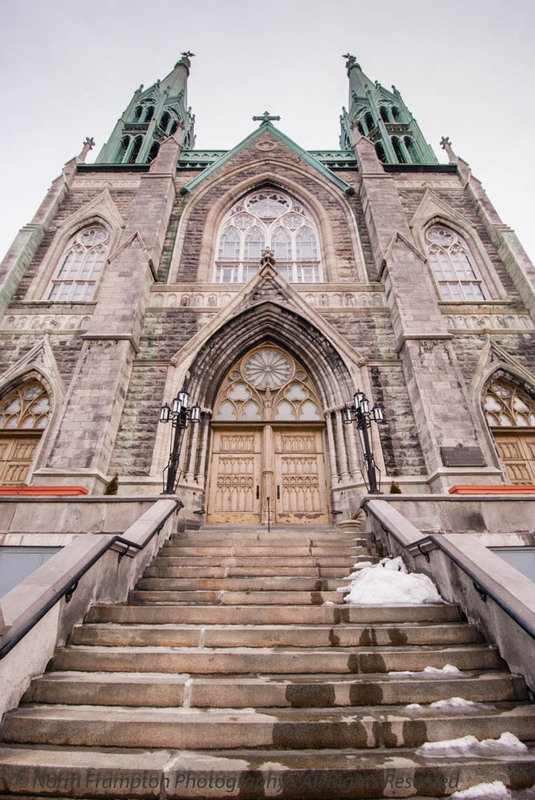 Yet another amazing church to be seen in Mtl! With beautiful doors too! Buildings like this just boggle my mind. So much beauty. I love the repeating arch details of this one, and especially the copper spires. That green patina is so beautiful to me. Those doors and building are impressive Norm. WOW. Here is my door Valentine themed doors for the week. What a magnificent structure! Those doors are grand — and the golden color is, to me, unusual, but just right. It’s beautiful and impressive on the outside. It must be just as lovely inside on a day with sun streaming through the windows. I love the towers with their green patina, and glass windows above the doors are lovely. I hope the doors get some TLC too! Wow! What a glorious building and set of doors. I think I would just stand there in awe. Thanks Joey. And yet again I’ll say (because I seem to say this a lot with the doors I’m finding lately) that I’ll have to go back and go inside. Thanks – yes it is quite impressive just standing there and looking up. The photo taken at the base of the stairs really does give an imposing and dramatic feel to the building. I have a *thing* for arches and they’ve carried that theme even into the carvings on the door. Now that you mention it, yes they are similar the ones at Toronto’s Old City Hall – now THAT is a gorgeous building! It’s funny, but I’ve never really paid much attention to Old City Hall until recently. What’s the expression? … familiarity breeds contempt? The words “stately”, “impressive”, “ornate”, and “beautiful” sprang immediately to mind. I love old churches and this one’s a beauty! That’s a beautiful church Norm. I love the massive and intricate glass above the doors and the upper row of windows. I do hope the doors get a little attention soon, it would be a shame to see them be damaged (or damaged any further). It’s telling to see where the water runs down the stone. These buildings really have to work for their survival in your city. Thanks Dan. I think it might be a budget issue for a lot of these churches as well. Fewer parishioners and fewer donations leaves less money for upkeep. A number of them have taken to applying for heritage building status to access public funds available to preserve historic buildings. In one older church that we belonged to, the Priest was well aware of every parishioner’s talents. I made several sets of repairs to the church and the attached convent. Thanks Judy. From what I read in my research they have a pretty impressive old pipe organ in there as well.